In 2015, Google launched Project Fi, a mobile virtual network operator (MVNO) compatible with Nexus and Pixel smartphones (plus the Motorola Moto X4). Three years later, the company announced the project has been brought directly under Google’s branding with a name change to “Google Fi.” But that’s not all — Google Fi is now compatible with a majority of Android devices and it also works with iPhones. Google Fi offers data, voice, and texting service for a flat rate, and boasts a robust network that reaches most of the contiguous U.S. It’s one of the few wireless carriers in the U.S. to refund you for the data you don’t use, meaning that if you churn through 3.5GB data in one month on a 4GB plan, you are credited the remaining 0.5GB. Fi is also unique because its network relies on a combination of U.S. Cellular, T-Mobile, and Sprint for coverage, and compatible phones switch between the three depending on network congestion and signal strength. The carrier also recently gained support for RCS Chat, meaning customers will be able to send larger image and video files when texting, as well as premium messaging features like read receipts, typing indicators, and more. It’s easy to sign up to Google Fi too. Not only can you sign up through the Google Fi website, but now you can also head to Best Buy and get a SIM card off the shelf. The downside to that, however, is that you’ll pay $10 for the Best Buy SIM cards. When you sign up online, Google will ship the SIM card to you for free. You can port your phone number from the existing service you use, rather than having to use a new one. If you use an iPhone or Android smartphone that’s not listed above, you’ll still have the same data coverage (including international coverage) and access to the same group plans. These phones just won’t get the network switching technology (so you’ll be stuck on one network, specifically T-Mobile), and there is no access to the Fi VPN to secure your connection. You’ll still be able to see members on your plan and data usage — whether on the iOS or Android app — and have access to 24/7 customer support, and more. It should be noted that visual voicemail is not supported on the iOS app at the moment. Google Fi works with more than just smartphones, but it’s not quite the same experience. A data-only SIM that lacks calling and texting features works on select iPad models and Android tablets; Google Fi subscribers can add up to nine data-only SIMs to a single plan. The fifth generation of mobile networks is coming, and many manufacturers are hyping up their upcoming 5G-enabled phones. But all of that means nothing if the networks aren’t also capable of putting out a 5G signal for those phones. Google Fi customers may have been worried their network would take a while to get access to the fifth-generation mobile network, but Google Fi 5G has been confirmed, thanks to continued support from Sprint. Sprint is aiming to have its 5G network up and running in nine major U.S. cities within the first half of 2019. These cities are Atlanta, Chicago, Dallas, Houston, Kansas City, Los Angeles, New York City, Phoenix, and Washington, D.C. When the 5G service arrives, Google Fi customers with Sprint 5G-compatible and designed for Fi phones will swap over to the new network immediately. While this group doesn’t include any specific devices yet, we imagine we’ll see 5G-capable phones added to Google Fi in the next few months, specifically the LG V50 ThinQ. In terms of pricing, Google Fi definitely isn’t the cheapest prepaid plan on the block. Republic Wireless, for example, offers talk, text, and up to 5GB of 4G LTE data for $40 per month — $30 per month cheaper than the equivalent Google Fi plan. Cricket Wireless’s $55 plan has unlimited talk, text, and data. FreedomPop’s 4GB tier starts at $35 per month. But while Google Fi’s plan isn’t the cheapest, it comes with a lot of perks. Pricing starts at a flat $20 per month for unlimited calls and texting and $10 for 1GB of data, but money for unused data is credited back to the user’s account. Overages result in a charge of $10 per GB used. Google Fi also doesn’t levy a fee on mobile hot spots — data used while tethering is deducted from a user’s monthly allotment. Another perk is “Bill Protection,” which basically gives you unlimited data for $80 (if you only have one line). That’s because Google will no longer charge for more than 6GB of data — so if you use 10GB, you will still only be paying for 6GB. The caveat is that Google says users might experience slower speeds after 15GB of data. Bill Protection kicks in at different levels for group plans — and you can see where here. Fi’s Group Plans let users add other people to their subscription for an additional $15 per user per month. Group Plans let plan managers view data usage by each member, set data notifications, add monthly allowances, and pause members’ data usage. A more recent feature, Group Repay, automatically calculates each of the members’ individual shares of the monthly bill and allows payments in fixed amounts based on an individual’s total usage, or only for data usage above the standard allotment. Fi subscribers can use 4G LTE data in more than 135 countries around the world, including Denmark, France, Greece, Italy, Japan, Norway, Poland, Russia, Spain, and Turkey (see Google Fi’s support page for the full list of supported carriers and countries). International data costs the same rate as Google Fi data in the U.S., and text messaging is free. Calls start at 20 cents per minute. Google Fi can be a good option for those who don’t use a lot of data but still want the option to use a lot down the line. If you consistently use more than 6GB of data, then T-Mobile’s One data plan might be better for you. Google Fi may technically support more devices, but you’re better off sticking to a handset from Google’s approved list. Family plans are no longer relegated to the major phone service providers. Google Fi offers the same package deal. Using a Google Account that’s managed with Family Link, you can add children younger than 13 to your Google Fi group plan. 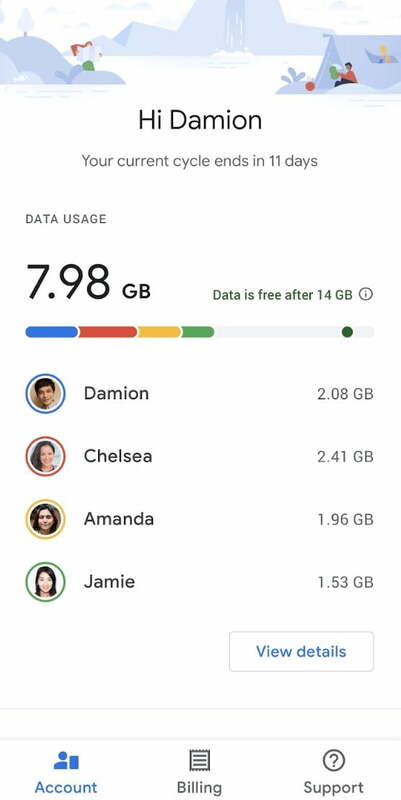 Once you have added your kid to your group plan, they can access all the features Google Fi already offers, including data alerts, seamless switching between networks, and automatic connection to free Wi-Fi hot spots. Setting up a Google Fi account for your family members is straightforward — you need to create an account on Family Link, add your child to your existing Google Fi group plan. 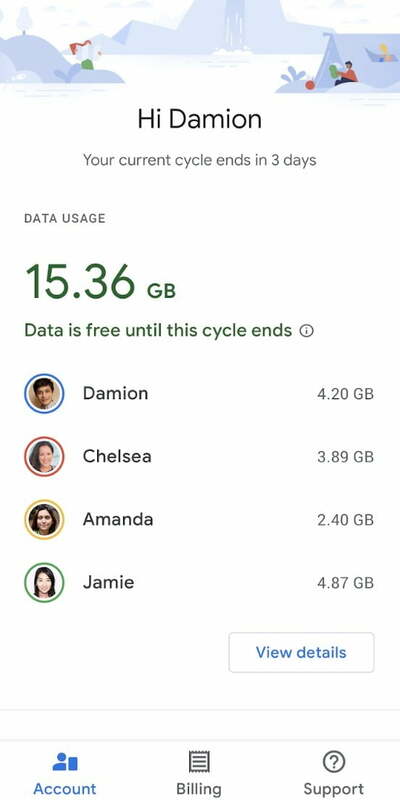 Google Fi also offers parents the option of managing their kids’ data usage, and with the Family Link app, you can manage the content that your children are seeing — at least insofar as their apps are concerned. You can also limit screen time, or lock your children’s phones when it’s bedtime, homework time, or mealtime. Parents can also set filters in Chrome, search, and other Google services. Google Fi-compatible phones tend to be expensive, but there’s an alternative: A trade-in program, which can gain you up to $440 in credit on Google’s store. The Google Store’s Terms and Conditions page lays out the rules for trade-ins. An alternative is Google Fi’s monthly device installment plans. Payments are made over a 24-month period, but you can pay off the remainder of your balance at any time. Updated on March 20, 2019: Updated text throughout.